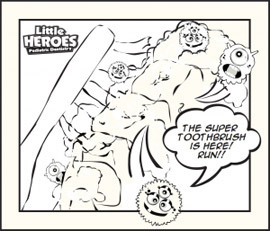 At Little Heroes, we believe in making dentist visits and oral hygiene an action-packed adventure! Whether it’s by brushing your teeth or visiting our power chambers, the mission for a bright and healthy smile should be as fun and exciting as possible. To help you and your Little Hero get in the zone, we’ve prepared a place of excitement and thrills for everyone to enjoy. An Adventure from the Get-Go! 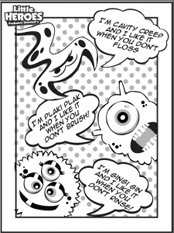 From the moment your child steps into Little Heroes Pediatric Dentistry, they’ll be outfitted with their very own super cape and led through our battle station to gear up in the fight against the ravenous Sugarbugs. Our team of Sidekicks and Caped Crusaders will accompany your Little Hero through their journey and inform you, the real hero, about the many ways you can help your child succeed in the mission for the best oral hygiene. The quest for immaculate smiles should be filled with joy and our team goes above and beyond to make your Little Hero’s dental visit as engaging and exhilarating as ever. We know that, as a parent, you want your Little Hero to show the brightest and healthiest smile, and we work hard to make it as fun and exciting as possible. Join the ranks at Little Heroes Pediatric Dentistry today to be part of our fun adventure! Download the coloring pages below for your Little Hero to enjoy and bring them by our battle station. Each month, we will pick a winner who will get an amazing t-shirt and will have their picture displayed on our Hero Wall. The time to take action is now and Little Heroes is ready to help! Click on the coloring page to download.